Of course. It's always her shoulder. At this point she is hoping that somehow she makes one last massive run, to save her from the embarrassment of her last several years on tour since she was banned, and get out "on her own terms". The question is, will she get it? It is not about Serena anymore. She has against her a lot of players that are more hungrier, play the same or more varied game, and are younger than her. I do not see her lasting much longer. It is not about Serena any more. She has against her a lot of players that are more hungrier, play the same or more varied game and are younger than her. I agree with you, I think Sharapova wants to leave the sport on her terms as well. I think that getting banned will follow her for a lifetime. As much as I admire SW I don’t see her getting to 24 (at her age now) with the talent that’s out there now. I certainly don't think her return has been an embarrassment-she has come back with pretty much zero support from the authorities, her peers or the majority of fans, has been battling injuries virtually non-stop & quickly rose back into the top 40 players from nowhere. She may not have been winning tournaments, but she has gone deep in many of them-including the second week of several slams not playing anywhere near her best & has knocked out some big names in them. Get well Maria & if you need a rubdown give me a call. Until her injury at Wimbledon 2015 (SF), she was competing with Halep for #2 in the world, was a champion in Rome, and a finalist at AO 2015. In 2016, before her ban, she was stopped at AO 2016 only by Serena. The considerable drop in results is obvious. Sure, but she certainly isn't an embarrassment. Before her motherhood Azarenka won the sunshine double and was a top 5 player. After her return she only once had a deep run at Miami open and rarely made it past the 2 round in every tournament she participated in. Is she using the shoulder as an excuse for her results since coming back from her suspension? Is she preparing to retire due to a chronic condition and also blame that condition for the drop off in her results since returning from being suspended? Is she a career top thirty player that doped and got better results at the expense of players that were playing clean? Sharapova should retire; hopefully it would be on her terms. I am not a Maria fan, but I believe any athlete goal toward the end of their career is to leave on their terms. Each pro tennis player has an expiration date, and Maria's date may have past. She'll be fine, she just needs some rest. What exactly do you mean? Her results when “healthy” have been decent, 2x R16 and a QF at four majors, won a title, went from no ranking to top 30. The rest is a lot of assumptions. Are you suggesting she has been faking injuries over the course of over two years (plus, her whole injury riddled career) as some elaborate hoax to make her retirement look better, or something? This looks like the reality what her entire career would have looked like without meldonium and whatever else she has used. This is her game. Definitely a touring pro, but not a top ranked contender for majors or a major winner. Yeah I understood that part, though I disagree—an injury plagued 31 year old is going to have a lower ranking than a 23-27 year old in their prime. I meant the “Is she preparing to retire due to a chronic condition and also blame that condition for the drop off in her results since returning from being suspended?” bit. pm me your # suresh! She's younger than Serena/Venus and almost the same age as Kerber. Why should she? because I don't like her, isn't that enough? She shouldn't endanger her heart, kidneys, immune system (couldn't tell which she last used, but one of those). It is all about her well-being. She's ugly on the inside. Now that's a good reason! That´s why she needed so much of it. Tell it to Venus, her sister Serena and Wozniacki. One has a chronic illness, another can't play without TUEs and "almost died" couple of times, and their friend Wozniacki also has a horrible condition. They all play still. This thread is about Pova. Feel free to make threads about all of the aforementioned (and, unlike Dopingapova, Venus and Woz have clearly diagnosed conditions which they manage without breaking the rules. I already gave my opinion on Serena, so that also leads you nowhere). Imagine a little Shriekarova dominating in 20 years. Some people just don't want the world to know about their conditions. It's a personal thing, and everyone has her/his right not to disclose it to general public. Dopingapova had ten years to figure out that declaring substances that help her fight her condition is required to be viewed as a clean athlete. I am sure that you knew that, so let's cut the BS and agree to disagree. It not like melfonium was illegal all those years she took it. It was illegal only for like two weeks. Het only fault is that she hires people who cannot read. By your last words I know EXACTLY where you stand. Being legal has nothing to do with the obligation to list it as used. 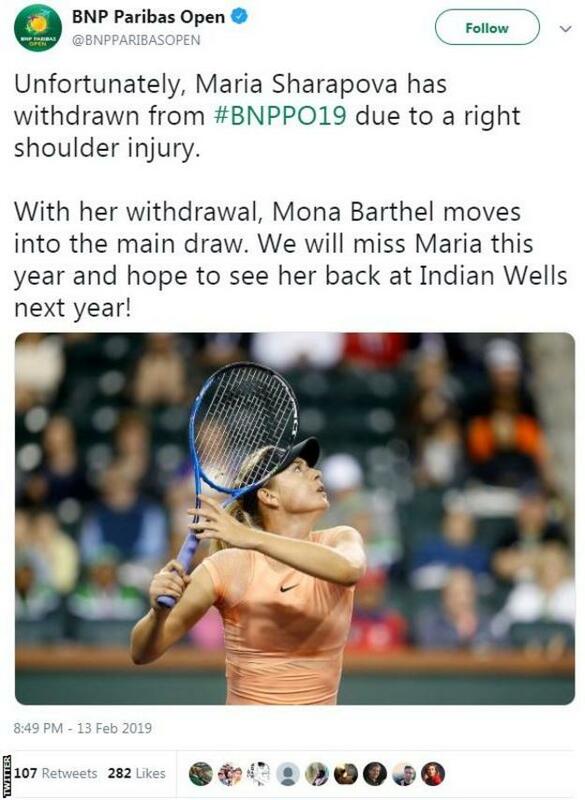 She has pulled out of a big tournament so long before the event with a chronic shoulder. As a player with shoulder pain, I know that I do not know how my shoulder is going to feel a month from now. So it seems that....maybe.... she is drawing attention to injury as the cause of her diminished results since her suspension. She is already filthy rich so she doesn't need the money, it appears that she has few, if any, friends on the tour. She has always seemed hyper competitive type so will she continue to play on the tour, in that situation for the results that she is getting? Oh, where do I stand I wonder. There is a lot of drugs on that list. She might use meldonium with TUE now, we will probably never know. It seems that it bother you more than you want to admit, but whatever. Have a nice Sharapova-hate-day. Apparently it did something since her results haven’t been good since she’s been back from the ban and hasn’t been able to use it. Because they know how to follow the rules when it comes to substances needed to save their lives that don’t violate the rules? Clearly Sharapova didn’t. There ain’t no big conspiracy here, no matter how hard you try to make one.